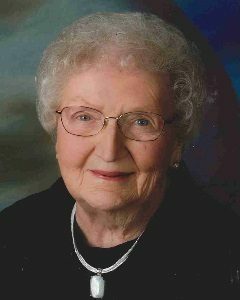 Dorothy Herbst, age 98, of Glencoe, Minnesota, passed away Sunday, April 7, 2019, at Grand Meadows Senior Living in Glencoe. Funeral Service will be held Thursday, April 11, 2019, 3:00 P.M. at First Evangelical Lutheran Church in Glencoe, Minnesota, with interment following at the church cemetery. Visitation will be held Thursday, April 11, 2019, from 1:00-3:00 P.M., two hours prior the service at the church. Dorothy Elizabeth (Gruenhagen) Herbst was born May 19, 1920, to Henry and Meta (Voss) Gruenhagen in rural Glencoe, Minnesota. The rite of holy baptism was bestowed on her at St. John’s Evangelical Lutheran Church in Helen Township, McLeod County, Minnesota, by Pastor A. J. Dysterheft on June 6, 1920. Her first five years of school were spent at District 39 in McLeod County. After that she attended St. John’s Evangelical Lutheran School and was confirmed at St. John’s Evangelical Lutheran Church on Palm Sunday, March 25, 1934, by Pastor A. J. Dysterheft. Dorothy attended Glencoe High School and graduated with the Class of 1938. On June 4, 1939, Dorothy became the bride of Clarence Herbst at St. John’s Evangelical Lutheran Church with Pastor A. J. Dysterheft officiating. Dorothy and Clarence lived on the Herbst farm west of Glencoe for 52 years, after which Clarence passed away in April of 1991. They shared over 51 years of marriage. Dorothy and Clarence were blessed with three children, Ronald, Doris and Kristine. After Clarence passed away, Dorothy made her home at 1812 Judd Avenue N. in Glencoe for 22 years. She thoroughly enjoyed her loving neighbors, friends, participating in church activities, playing cards and still did some quilting. Then in July of 2014, Dorothy sold her home and moved to an apartment at Orchard Estates in Glencoe, where she continued to enjoy playing cards, bingo and visiting with other tenants there. In March of 2018, Dorothy moved to Grand Meadows for assisted living services because of her declining strength. Dorothy was active in her children’s school activities and loved to quilt, crochet, embroider, garden and spent many hours in her canning kitchen preparing canned and frozen foods. Her family treasured the quilts and handmade gifts she made with so much love and are cherished by family members that received them. She left a daily diary since 1982. Dorothy was a member of the First Lutheran Quilting Group, Missionary Society, Lutheran Women’s Missionary League (LWML) and a longtime volunteer at the Glencoe Regional Health Services Gift Shop. Her 70 some years as secretary-treasurer of her high school class were special to her as she helped organize the class reunions, thereby keeping in touch with her classmates. Dorothy passed away peacefully on Sunday, April 7, 2019, at her apartment at Grand Meadows Senior Living in Glencoe, Minnesota, at the age of 98 years, 10 months and 19 days. Nephews, Nieces, Other relatives and many friends. Dorothy was preceded in death by her Parents, Henry and Meta Gruenhagen; Husband, Clarence Herbst; Infant Brothers, Lawrence Gruenhagen, Walter Gruenhagen; Sister, Esther Mackenthun and her husband, Herbert. Dorothy was a beautiful woman inside and outside. She and I worked together for years. She was so thoughtful and kind. God Bless her family. Bonnie Davis called me yesterday to tell me about your mother passing away. I was so saddened to learn about her passing. Your mother was a lovely and kind lady. My mother, Myrtle Voss Eling, was her 1st cousin and they were very close. They loved talking on the phone for many hours, reliving their childhood in Glencoe with all the Voss cousins. Mom and I would drive from St. Paul to visit Dorothy. We enjoyed our time together and lunches in downtown Glencoe. Myrtle passed away 3 years ago, and I am sure both she and Dorothy are talking together again.